It's crazy to think that we'll be celebrating our two year anniversary in only a few months. When people ask how long we've been married, I always want to say it'll be a year in February. When it's actually going to be two years in February. It's confusing for me, somehow. I feel like it was just recently that I was busy melting into a small, angst-ridden puddle of stress over the wedding planning and all of that. It all went by so quickly. It just goes to show: the wedding is just one day, marriage is forever. In hindsight, the wedding is such a teensie tiny little part of it all. And considering planning stressed the buh-jezus out of me, the whole time all I was looking forward to was being a wife. Being married. I wasn't one of those bridezilla's who has a coronary when the bridesmaid's shoes are dyed two shades lighter than the ribbon on the 17th century victorian-style centerpieces (if there is such a thing). I, on the other hand, was having a coronary because I was planning a wedding without the immediate help of my mom (two states away), sisters (two states away) or a wedding planner (those dude's be pricey). I felt like alot of it was on my shoulders, and I'm definitely not the kind of person who likes to take charge. Ever. It's just how I am. So, it was definitely a tough time. I couldn't wait to walk down the aisle, cut the cake, dance our first dance and then drive away knowing that we had the rest of our lives to spend together. Since I've been married, I've come across entirely too many cynics. My favorite exchange? I always look at them oddly (fighting the urge to give them my best stink-eye) and respond with a, "Yeeeessss?" I mean, what do you want from me, people? Yes, I'm twenty-three. Yes, I'm married. Happily married. I can't imagine what else they expect me to say, really. I don't have it all, but sometimes it sure feels like I do. We just passed the one year mark and I feel a lot of the same things. Sometimes it's like...whew, time flies! Other times I feel like marriage just "fits" so well it came naturally and I can't imagine life without it. Okay... so I was looking at your flicker, and I think that we should pick a theme every so often and then send each other packages pertaining to that theme. Like with your blue matchbox and whatnot, cause it's so awesome. What do you think? Sound like a good idea? That way we can be crafty and original! It's like a swap that you know isn't going to be crappy. And I just adore the fact that you think you spend too much money at Michael's, and too much time trying to find your calling in life. I swear I have those same problems. I remember the weirdest things about my trip to be in your wedding...remember the 'wedding coordinator' who barked orders? We got yelled at for not walking correctly OR at the right time. 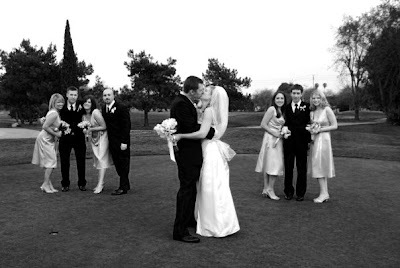 Then at the reception, when we unknowingly aerated the golf course green. Yikes. Did I ever send you my millions of pictures from your wedding? Congratulations! I love marriage too. It takes work but it is so worth it. We have been married 3 years and it still seems like we just started, but that it has been forever. Know what I mean? I know exactly what you are talking about. I had to plan my wedding with out the help of my Mom, it was all on me. Now when I hear someone talking about plans for the wedding my heart freaks out real fast because I think I have to be planning a wedding, but then I remember I did it. It was perfect and now it is someone else's turn. I send a little prayer their way and then dance on with my happily married life.